Storytime in The Sun! We were delighted to be picked up by The Sun newspaper’s books editor Natasha Harding and featured in their Something for the Weekend section – particularly as this supplement is usually solely dedicated to books (mostly adult fiction). 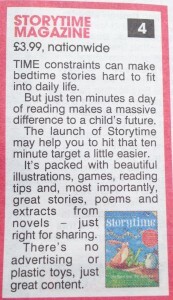 It’s a rare thing for a children’s book to get mentioned in the mainstream national press, let alone a magazine. We couldn’t agree more with her “just ten minutes a day of reading” mantra – and we’ve seen and heard first hand from our readers what a huge impact it can have. 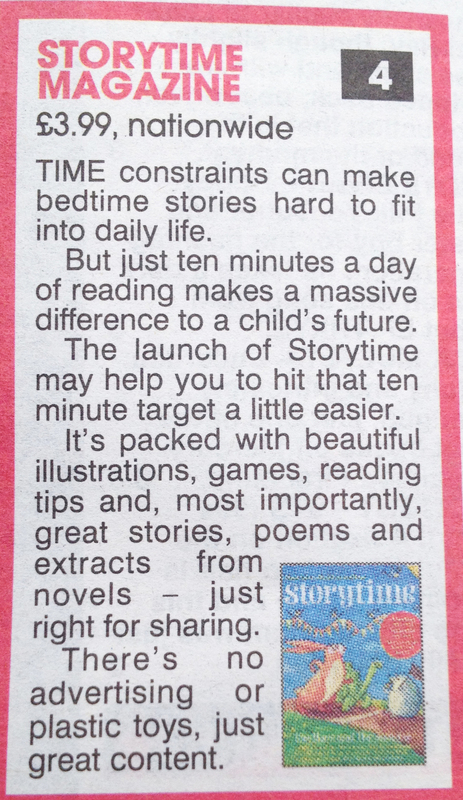 Such a small amount of time… such a huge difference to children’s confidence and ability to read. If you need more convincing of Storytime‘s power to help children fall in love with reading, have a look at these comments from readers and pro book bloggers, feedback from Twitter and reviews from the press. We’ve even had the honour of getting the seal of approval from former children’s laureate Sir Michael Morpurgo. Read more about it here. If you have any comments or feedback – or if you’re a blogger or member of the press who would like to review Storytime for your publication or website, do drop us a line at hello@storytimemagazine.com We’d love to hear from you!